(UKWMS – 13/08/2018) “Beyond Words”, that emerged in 2013, is a journal managed by the Graduate School of Widya Mandala Catholic University Surabaya. All of articles submitted to this journal were carefully sorted out by the Chief Editor of Beyond Words, Prof. Dr. Wuri Soedjatmiko. Starting from coordinating the sorting process, sending articles to reviewers, and all the way until publishing process, all under her responsibility. For publishing online, Wuri is assisted by Vincentius Widya Iswara, S.S., M.A. from the Library of WMCUS. Vincent’s task is to manage the journal display and the management of the ISSN (International Standard Serial Number). After completing the ISSN, they tried to enter the article to international indexers. Year after year Beyond Words has been submitted for accreditation to the Directorate of Higher Education, but there are many obstacles and things that must be corrected. Not giving up, Vincent submitted it to DOAJ (Open Access Journal Directory) and has been indexed since 2017. Finally in 2018, the Ministry of Research, Technology and Higher Education gave Beyond Words the third rank as an accredited journal from a total of 6 rankings. This accreditation was submitted by the Director General of Strengthening of Research and Development of Higher Education and was received directly by the WMCUS Rector, Drs. Kuncoro Foe, G.Dip.Sc., Ph.D. Apt., at JW Marriot Hotel Surabaya. (UKWMS – 14/08/2018) The Ministry of Research, Technology and Higher Education facilitates educational institutions in Indonesia by subscribing to a variety of e-journals that cost a lot of money. E-journal is a solution to get reference to scientific information easily and quickly. However, the utilization is still considered to be lacking so that the Ministry of Research, Technology and Higher Education held an “E-Journal Database Utilization Competency Enhancement Workshop” at Widya Mandala Catholic University Surabaya Pakuwon City Campus on August 14, 2018. 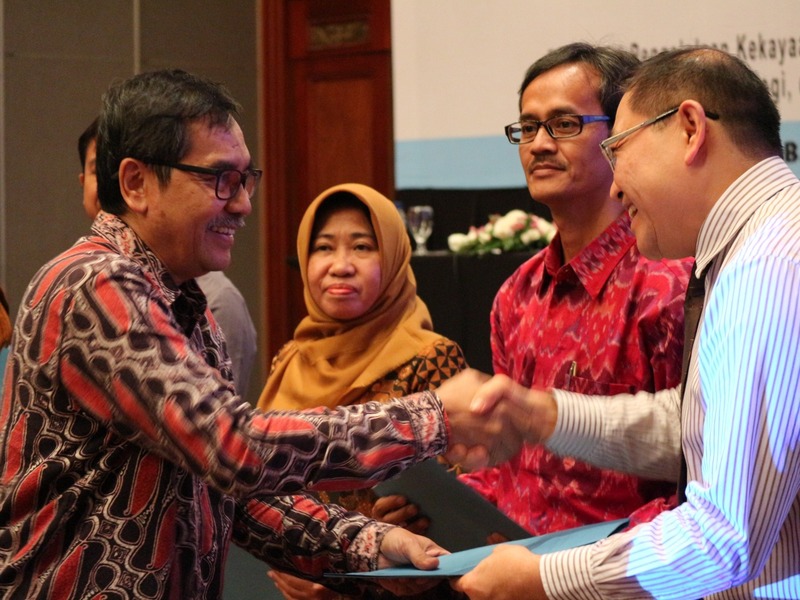 This workshop was the result of a collaboration between the Directorate of Intellectual Property Management and the East Java University Library Forum. Held in the East Theater auditorium, the workshop was attended by library employees and lecturers from various regions in East Java. Before starting the event, there was a speech from the WMCUS Rector, Drs. Kuncoro Foe, G.Dip.Sc., Ph.D. Apt., who was very grateful for the implementation of this event. “Events like this are very useful for strengthening research through the E-journal facility. I hope that everyone in here can absorb as much knowledge as possible, so that when you return to your respective institution, you can share your knowledge with everyone,” Kuncoro said with a smile. Then the opening of the event was conducted directly by the Head of the 7th Region of Institution for Higher Education Service of East Java, Suprapto, accompanied by a lively applause from the audience. To start the session, there was a brief explanation by Sadjuga as the Director of Intellectual Property Management, which contains data on the use of e-journal in Indonesia and SINTA, which is a short for Science and Technology Index Database. The first session started with Sony Pawoko who explained about the “Introduction and Utilization of E-Resources in Research and Technology of Higher Education”. Utilization in the field of information literacy uses several sites such as Ebsco and Proquest to facilitate the search for keywords of research topics. “After finding supporting results, we can see the trend of research that is developing on the topic, for example, the topic of malnutrition. At Sinta, we can see various kinds of research related to malnutrition as a reference,” explained Sony to the audience. Participants, who many brought their laptop, immediately accessed and opened the intended material. Sony also showed ways to conduct search strategies on search engines so that the results are effective and matching to the needs. Accompanying Sony, there was also Dwi Fajar Saputra who explained the use of online journals through the Scopus website.